In My Mailbox is a weekly meme hosted by The Story Siren, in which book bloggers post about the books they've bought, borrowed or received in the past week. I went away for the weekend, and the nearby town happens to have a bookshop I really like. I bought How to Save a Life by Sara Zarr, which I'm really looking forward to reading. We also passed The World's Smallest Book Store and I bought Pickwick Papers by Charles Dickens and So Many Books, So Little Time by Sara Nelson. Earlier in the week, I was in the little shop in my library buying a travel book for my dad. I happened to find The Disreputable History of Frankie Landau Banks for 50 cents, which I read in September and loved (review here.) From the library, I took out Grace Williams Says It Loud by Emma Henderson. 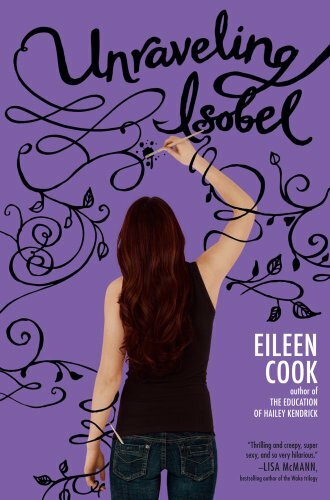 From Simon & Schuster's eGalley program, I received Unraveling Isobel by Eileen Cook. I love the cover and the title of this book! I've read one other book by Eileen Cook (The Education of Hailey Kendrick,) and although I didn't like it, it was only because the main character drove me crazy. It was still well-written and I think I said in the review that I'd be willing to read another of Cook's books. So, that's it for me this week. Feel free to post the url to your IMM in the comments. That's a really lovely edition of Pickwick Papers! How to Save a Life by Sara Zarr was on NetGalley a while ago and I wish I had requested it because a lot of my fellow blogger friends loved it. I really like the cover for Unraveling Isobel too, although I AM into purple lately. I got Unraveling Isobel too I've been told it was great! Wonderful mailbox!